"This is the best kind of day" she said, contentedly. Upon request, Safiya had asked me to teach her to crochet, again. Except I made a fatal mistake. I gave her the cheap cotton yarn to learn on, which only ended in frustration, obviously. You'd think I would have remembered that the pleasure is not only in the learning and the accomplishment, but in the materials. "What about finger knitting?" She was game, especially after I pulled out my most favourite yarn - a beautiful creamy slubbed merino that I had never done anything with - and her eyes lit up. "Are you sure? Are you sure I can use this?" Well, I wasn't doing anything with it, was I? And so that's how the above proclamation came about. 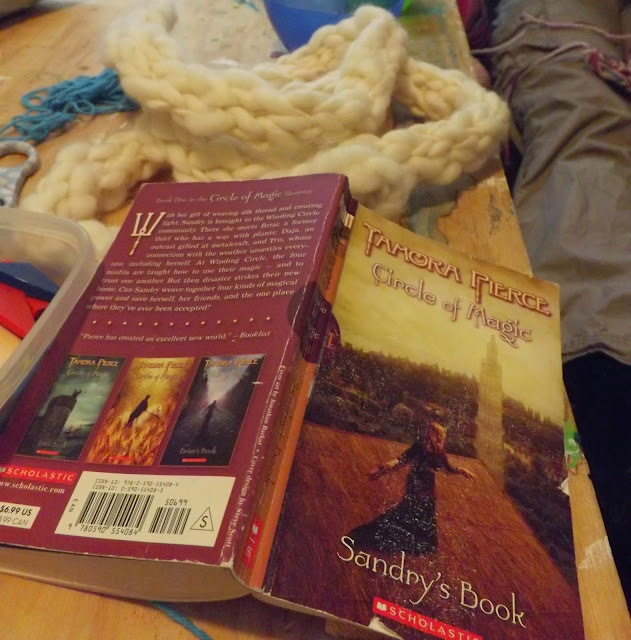 Zinadine playing trains, Safiya knitting away, and me sitting on the playroom floor, reading a new-to-her book aloud. Ever since Safiya really began to read on her own, she hasn't been that interested in us reading out loud, but she commented on how nice it was, especially since she had something to do with her hands. We were supposed to do multiple things that day, obligatory things, but it just didn't seem to be the right day for it. As I get older, I listen to that voice a bit more. The best kind of days are the ones that you make for yourself. To purposefully step outside of the push and pull of the calendar and the necessary things of life is a skill that has been hard to learn. I don't mean just hanging around and shirking, although that's fun sometimes too :) It's more understanding the value of what is happening rather than running away from what should be happening, if that makes any sense? Stepping aside without guilt or feeling the need to make an excuse is hard, but important. Is going to lessons important? Yes. Is it more important than learning a new skill? Maybe, maybe not. Maybe I wasn't interested in that particular value judgement that day. I asked her what she wanted to do and she made a choice. Will Safiya remember that she missed karate class? Nope. Will she remember that we sat together and learned something new and read a new book and were content? Wholeheartedly yes. Katya's totally into finger knitting these days too! I wish we weren't so far apart.